Consider a system being designed for a public library. Public libraries generally hold a collection of objects that can be lent to library card holders, including books, magazines, e-books, movies, etc. A library may want a system for tracking the location of these objects in the library, and allowing both employees and patrons of the library to search and find objects. Once an object is located, a patron may wish to borrow that object, and will later return it. The system would need to keep track of these objects whether at a library branch, or currently being borrowed by a library member. In addition, circulation employees would need the ability to identify objects that are overdue, and calculate fines for patrons that are attempting to return overdue materials (or when checking in an object). Users of the library can not only borrow objects from our own library, but have access to resources available through a regional library organization. For example, a user can request to borrow a movie that is only available at another library, which may not be part of the library organization. Not only would our system need to have the ability to track objects lent to patrons, but also objects lent to other libraries that request our resources for their patrons. Some objects, particularly rare or expensive objects, may need to be flagged such that other libraries cannot borrow those objects directly, in order to reduce risk exposure (those patrons would have to borrow these items directly from our own library). There may need to be special handling for objects that our library has obtained through an inter-library loan as described here. Librarians may also use the system, although their primary role is research and assisting patrons. They would need to search and locate books, and have the ability to establish and manage the taxonomies for objects owned by the library. 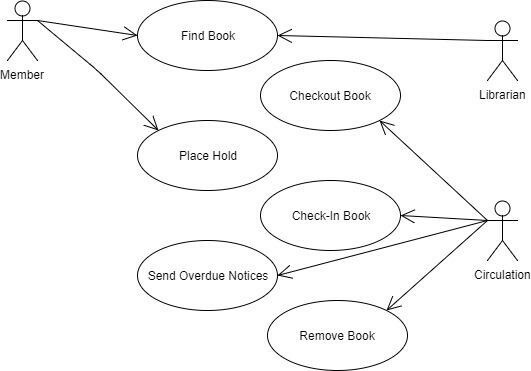 Using this narrative description of a public library, and your own experiences with how libraries operate, take a look at the use-case diagram provided below. There are both syntax and logical inconsistencies in this diagram; try to identify at least two syntax, and 4 logical errors or omissions based on the scenario described.